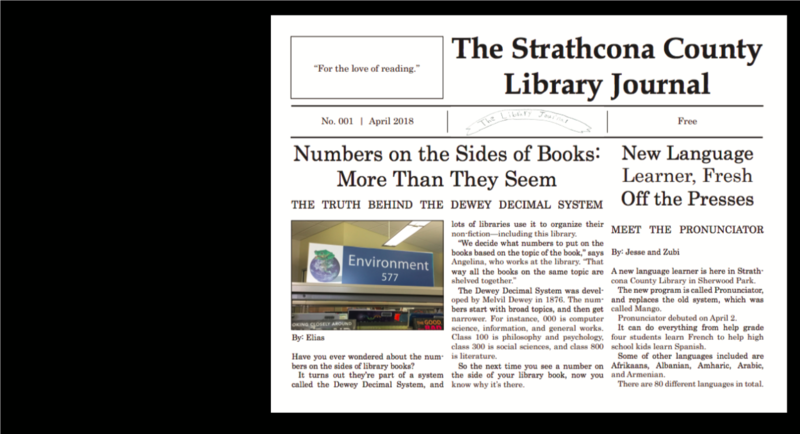 The Strathcona County Library Journal is a kid-made newspaper, created in an Edmonton-area library over four afternoons in spring break. When reporter Bridget Gutteridge-Hingston noticed library plants with “bone dry” soil, she knew she had her story. “They looked like they hadn’t been watered in at least a few days,” said the 11-year-old reporter. Bridget’s resulting article was one of several in the Strathcona County Library Journal, a pop-up newspaper made by more than a dozen kids at an Alberta library over spring break. The newspaper includes scoops like “The truth behind the Dewey Decimal System;” an “exclusive” look inside the library sorting room; and an op-ed arguing that libraries should give kids more time to borrow chapter books. There are also several book reviews, comics, and a hand-drawn word search. Kids are natural journalists, said Michael Hingston, writer-in-residence for the Metro Edmonton Federation of Libraries. He ran the drop-in program and acted as editor-in-chief for the team of elementary school reporters, photographers, puzzle-makers and editors. While he expected the project would be fun, Hingston said, he wasn’t anticipating how much he’d learn about how differently kids see the world — and what happens when you give them the tools of journalism. Children are curious, full of great questions and ideas, and see spaces from an entirely different perspective, said Hingston (who is also Bridget’s dad). One girl, for instance, embarked on a classic “streeter,” asking people in the library about their favourite book. While pros tend to dread the streeter assignment, this fearless young reporter had dozens of answers in no time. 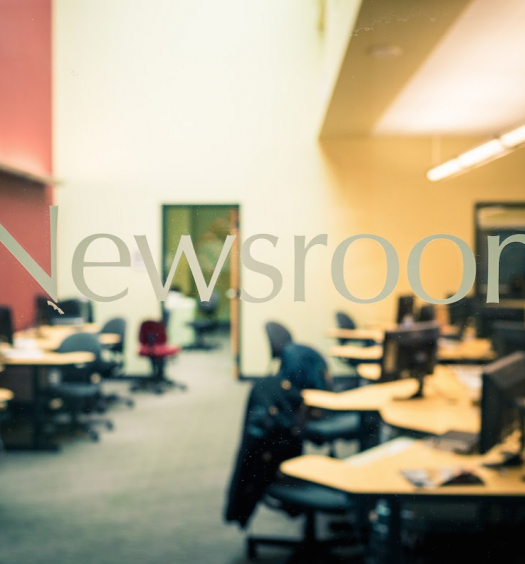 “It’s almost like kids are born with the tools to be great journalists, and then it kind of gets beaten out of them a little bit as they grow up,” said Hingston, who’d always been interested in how kids get into journalism. He wanted to show kids how much fun it can be, but also to emphasize all of the often-invisible jobs, people, responsibilities, checks and balances that go into producing accurate news. “Not that this was the case, but I just think if kids are hearing messages like ‘oh the news is all made up’ … I wanted to show them that it’s actually taken incredibly seriously by the people who do it,” said Hingston. Part of the process was showing kids they can ask adults questions, or challenge the status quo. One young reporter wanted to know why he could no longer play his favourite games on the computers — the library had changed the settings and limited which games kids could look up. When he asked, staff told him they made the change so kids couldn’t look up inappropriate websites, but Hingston could tell he wasn’t satisfied. He suggested the boy go back and ask what it would take to reverse the decision. Turns out, if enough kids complain, the library would consider changing it back. Kids see spaces in an entirely different way than adults, Hingston said, and think of questions and stories adults would never consider. The kids could tell they were being entrusted with responsibility in making the newspaper, Hingston said. First and foremost he wanted it to be fun, but Hingston thinks kids came away from the experience feeling empowered. In Bridget’s reporting, she learned that a staff member waters the plants once a week–but she didn’t think that was sufficient. Bridget said she really liked reporting the story, and thinks it will lead to better-hydrated plants. She loved getting to choose what she wrote about; it’s a kind of freedom you don’t get at school. “The whole premise was that it was all according to what the kids wanted to do, and I think when you give them the responsibility they really take to that,” said Hingston. 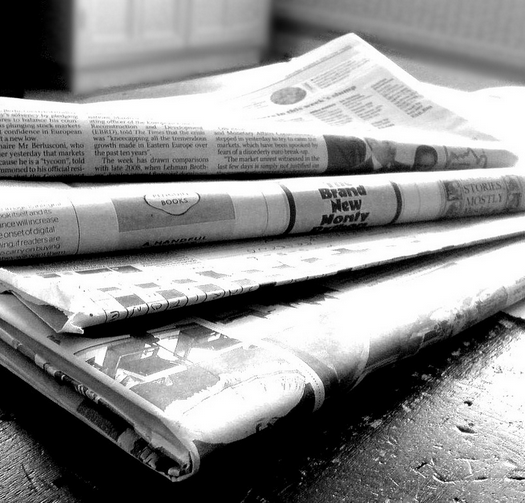 Hingston hopes others do their own version of this pop-up newspaper program. It’s an accessible project that doesn’t have to be based in a library, he says; all you need is a bunch of kids who have some time. “If you ask them to look around and tell you what they’re interested in, you won’t have any shortage of material to draw from,” said Hingston. Editor’s note, June 6, 2018, 5:22 p.m.: An earlier version of this story incorrectly spelled Bridget Gutteridge-Hingston’s name. We apologize for the error. Laura Howells is a journalist and masters student in Toronto. You can reach her at laura.r.howells@gmail.com.